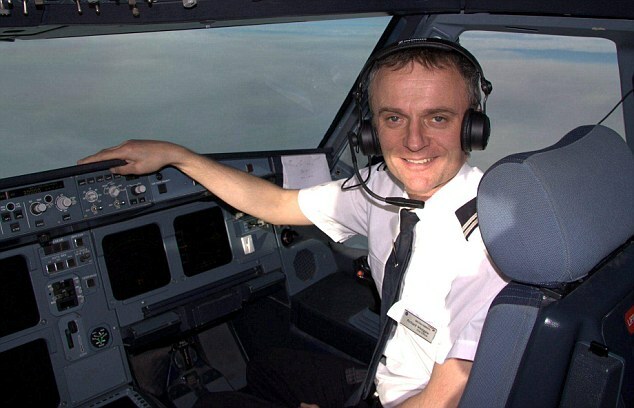 Aerotoxic syndrome has hit the headlines today with the publication of this photograph of Richard Westgate, 43, who died after instructing his lawyers to sue BA for health and safety breaches just days before fellow pilot Karen Lysakowska, 43, passed away, news reports say. Both pilots had claimed they had been poisoned by the fumes that can contaminate cabin air and which regularly force pilots to wear oxygen masks. It has been reported that Mr Westgate’s lawyers want to ‘give him the trial he never got’ by suing the airline in a case they say will be a ‘moment of truth’ for the aviation industry, and that they are on the cusp of proving in court the existence of ‘aerotoxic syndrome’, a chronic physical and neurological condition they insist will one day be seen as ‘the new asbestos’. The problem was first highlighted by Liz Bestic, who has written on aerotoxic syndrome exclusively for Under The Scope here. Neither Ms Lysakowska, described as one of the most talented pilots of her generation, nor Mr Westgate, a world record-breaking paraglider as well as a commercial pilot, were flying at the time of their deaths. MS Lysakowska had been grounded with ill health in 2005 and later develped cancer. Although she wrote to her employers BA in 2006: ‘My objective is to get well and carry on flying and not enter a protracted legal battle because of the impact exposure to contaminated air has had on my life but if I have to I will’, in the end, she did not go ahead with the case. Mr Westgate voluntarily grounded himself in 2011 after suffering whiplash in a car crash. How can you tell if there is a fume event? Short term symptoms of exposure can include blurred or tunnel vision, disorientation, shaking and tremors, loss of balance or vertigo, seizures, loss of consciousness. Some people report a cough or nausea others have increased heart rate. Long term symptoms include numbness in fingertips, memory impairment, headaches, dizziness, depression and chronic fatigue. You can read more about the problem in Seconds to Disaster by Ray Ronan and Glen Meade. 5 Comments on "Aerotoxic syndrome – pilot’s claim goes on"
“He was then medicated to the extent that he lost mental capacity. During the period the Official Solicitor of the Supreme Court acted as his Guardian ad Litem, three Court of Protection medical certificates (CP3s) had been obtained but not registered with the Court of Protection. He was, therefore, for nearly 18 months regarded as a mentally ill patient without access to the Court of Protection. During this time considerable amounts of his assets went missing”. Test by Professor Abou-Donia in January 2006 Professor of Pharmacology and Cancer Biology and of Neurobiology Tau and MBP suggest the presence of moderate brain injury. Consistent with chemical –induced nervous system injury. My first recorded fume event was on the 29 November1991. During the take-off run having passed V1 (a speed at which the aircraft was committed to becoming airborne) the aircraft flight deck filled instantly with hot acrid fumes. The Captain and myself were blinded, unable to view instrumentation or gain any visual reference, our skin was burning and we could not breathe. As the handling pilot I allowed the aircraft to accelerate for several seconds prior to becoming airborne. The Captain (a highly experienced pilot with many years experience on this specific aircraft type) with no visual reference, but by feeling this way along the instrument panel located and then opened the dump valve (This valve in effect lets air out of the aircraft). Within about 3 seconds the fumes cleared. The incident lasted for about 15 seconds. For those 15 seconds we were blinded, unable to breathe and accelerating in excess of 160 mph. Oxygen masks were activated, emergency drills actioned and an emergency declared to Air Traffic Control. An emergency landing was made and the aircraft evacuated. Both the Captain and myself were employed by and trained by the aircraft manufacturer British Aerospace. One wonders how a less experienced crew would have managed. The aircraft and documentation were subsequently exported to Russia. My last recorded fume event occurred in 2004. The Captain (a recently retired United Kingdom Civil Aviation Authority Flight Operation Inspector) was the handling pilot. During a fume event he had the aircraft descend to within 500 feet above the city of Amsterdam not established on any published instrument approach and with no visual reference to the runway. The only time it is ever safe to be this low is during takeoff and landing. What is even more concerning is that I too failed to intervene. I can still recall the oily smell on the flight deck! At 500ft and confused we instigated a climb to 1500 feet. I still do not understand how this situation occurred. The next day enroute to Italy, Swiss air traffic control gave a re-routing over Switzerland. Both I and the Captain were unable to process the information being given! That was my last ever flight before I resigned. Why did I resign? Because I could not and indeed still cannot think clearly enough to fly. Aircrew worldwide know what is causing their neurological, respiratory, neuropsychological, psychiatric conditions. Many are afraid to come forward in fear of losing their livelihood, particularly given the powerful Government and Aerospace industry opposition to this issue. In the Swiss Air Accident Investigation Bureau report into a serious incident involving the Avro 146 RJ 100 registration HB-IXN on the 19 April 2005 the medical examination of the co-pilot after the flight showed that during the flight toxic exposure took place. What I cannot understand is why in my own personal experience consultant psychiatrists declined and failed to view the 2003 AOPIS DVD “Aircraft Air Contamination” when both the British Airline Pilots Association (BALPA) and the Independent Pilots Association sent this DVD out to it’s members presumably to prevent misdiagnoses. My personal experience is well documented, medically misdiagnosed and with three Court of Protection Medical Certificates CP3s issued but never registered by the Official Solicitor. With other solicitors and doctors denying their existence, I was held as a captive mental patient for almost 18 months with most of my assets disposed of. So, heavily medicated, misdiagnosed by psychiatrists, unable to take care of myself, simply because psychiatrists failed to eliminate any organic cause that could be related to aircraft fumes. Psychiatrists must consider the possibility of physical causes if there is a clinical reason for doing so. Thankfully the fifth psychiatrist did and I regained my mental capacity. Only after a circuit judge allowed me access to records were the Court of Protection Medical Certificates located. (Following representation by Members of Parliament to the Secretary of State Rt Hon Jack Straw, Ministry of Justice), has the definitive response been given that it was the responsibility of the certificate holder to ensure that these certificates were registered. One questions how many others have, are, or will suffer a similar fate? BALPA’s Medical Officer directed my General Practitioner to refer me to Professor Turnbull a CAA approved psychiatrist (whose team did view the AOPIS DVD). I have no doubt I would have continued to be misdiagnosed. Thankfully BALPA arranged for myself and a few others to have specialist blood tests for which I will always be grateful. The test identified chemical induced nervous system injury. During my flying training little did I realise how in later years I would come to rely on the Cockpit Resources Management Training (CRM) and Human Factors Training I had received. “Mr Lawrence I see that you have been exposed to TCP – that’s an antiseptic”. “No doctor TCP stands for tricresyl phosphate – an organophosphate”. There was silence! I continued to receive treatment from a hospital that has and continues to provide specialist treatment. I now know the nature of the beast that I am fighting – tricresyl phosphate. How many have still to identify their possible current psychiatric misdiagnosis to that of an organic cause? A professor of Psychiatry wrote “Dear Len, I think that Dr Jamel at the Hospital is intending to follow you up by pursuing neurological investigations. I think it’s very likely that we are pursuing the same problems but through a different line the psychological and behavioural line. There is a point where psychological issues meet up with physical issues and I think that is what’s happening here. Dr Sarah Mackenzie Ross a clinical neuropsychologist from University College London has undertaken research on 18+ pilots said to be exposed to oil fumes on the BAe 146 & B757 & found a pattern of abnormal cognitive deficits in all 18. It was the same pattern to similar research undertaken by another psychologist (Leonie Coxon) in Australia testing another group of pilots also said to have been exposed to oil fumes. For your interest these are extracts from some of his last emails beginning on 25th October 2012. Makes some pretty distressing reading given what happened later. I am a British Airways pilot suffering from 15 years of exposure to neurotoxic organo phosphates. I am bringing a legal case against BA, the DFT and CAA which will hopefully change the world for the better. If you have the time, I would like to talk to you regarding your experiences to avoid duplicating work and to avoid potential pitfalls. Unfortunately, it was their attempt to get my brain working with Quetiapine that killed me, shut down my endocrine system and released so many toxins that my liver and kidney function stopped. When I asked for the ‘antidote’ it all went very quite. I was literally sent home to die with pain killers. At least I now know why! I am personally comfortable in the knowledge that ‘they know what we know and we know that they know what we know’. I am interested in genetically testing and protecting my family, nephews, god children and friends; then any future pilots (include it in the initial first class medical) and my colleagues still flying. If a simple genetic test can prevent a huge amount of suffering in the future then it should be available to anyone. When I came here I knew I didn’t have long to live. I was sent home to die with pain killers by my GP. That was confirmed by one of the specialists here who said I didn’t like to tell you but…I said, why do you think I’m here! Unfortunately, when you know you know. Brain ends up on the wrong side of the drag curve. I had already said goodbye to my family.The brain has a hyrarchy of energy management and preserves as much energy as it can for itself. When it can’t even get enough energy to supply itself, it dies. Brain cells cannot survive in an anoxic environment. Toxicity and apnea have resulted in severe apoptosis with limited functioning and extreme pain. With the time I have left, I am determined to protect my friends and family. A couple of pilot friends have already been out to be genetically tested. At least they are taking me seriously. If I can put my name to a bill which puts genetic testing in the first class medical then my job is done! I have passed your thoughts onto my lawyer in the hope that he can head off the same problems that you had with the OP debate. We want to use the genetic argument in our favour. The CAA have admitted that every pilot has TCP in their bodies but if they ‘eat well and can detoxify then it isn’t a problem’. The legal argument is that genetically some pilots can’t detoxify at all and therefore are in danger of bio accumulation and a toxic injury. I want to see all pilots DNA tested to ensure that they are long term fit to fly. +++++++++++++++++++++++++++++++++++++++++++++++++++++++++++++++++++++++++++There are already pilots who have demonstrated that they have high levels if TCP in their bodies and the airlines have admitted that the only place that it could have come from was the work place environment but because they could not prove exact time and date of exposure, the action failed. I liken this to Asbestos claims in the 20’s. Now mesothelioma is a recognised industrial disease and just by having the disease it proves exposure and claimants can seek compensation without proving causation. I hope that OP poisoning follows the same path. you are more than helpful thank you. Unfortunately I have spent months formulating legal arguments based on the very premesis which you have already tried. My cholinesterase is also low and will not recover despite 5 months of treatment. I thought that would be a great card in the back pocket. I quite agree with the Bio Accumulation argument. How the hell do we bust this wide open? I do not want to see anymore 25 year old pilots who can’t feel their hands and feet! For the first time in my life, I am beginning to wish very bad things on a few people at the top! How the hell do we proceed? I agree that we don’t have that long. I am busy getting all my close friends and family, my nephews and godchildren genetically tested and I am advising them whether it is sensible to fly, have the MMR jab, inoculations etc. The rest of the world will have to wait. Interesting piece in the Independent from a geneticist saying that as a species we are gradually succumbing to genetic mutation and it all started when we moved into cities (became civilised!). Of course all his colleagues have come out saying that he is completely wrong. I am hoping to make a claim against BA soon but we are effectively pressing the take-off button with the plane half built hoping that the team of engineers on board can build it before it gets to destination. I do however, need to get the aircraft in the air. You are the most knowledgeable person that I have spoken to regarding both clinical and legal matters so your advice would be much appreciated. I am very badly damaged and, in my opinion, if the team can’t make a case from me then they can’t make a case for anyone. Having seen all the misinfomation over the years, including not being able to prove parenthesis! what objective data can we use to definitely prove OP/TCP poisoning? What else would you be looking at? Many thanks for your erodite feedback. The reason for concentrating on TCP is that it is a specific identifier of high temperature turbine oil and is easily detected in the cabin. Luckily, the argument isn’t complicated too much because my carear has always been short haul and there is no routine insecticide spraying on board. I came into this thinking that I was the first one out of the trenches running towards the machine guns; that I had a guaranteed way of knocking them out and that the world would take note and change; only to discover that I am running over tens of thousands of dead bodies from those who have gone before me. Unlike a traditional war, they are people that I had never heard of, battling a silent war of pain and suffering. Their names will never appear on a war memorial and their valiant efforts never be properly recognised. Perhaps the only hope is that the pile of dead bodies will eventually get high enough to stop the bullets that way…..the naivity of youth! The huge advantage that I have is that all the evidence is in Europe not with the NHS. It can’t be tampered with or made inadmissable. Many thanks fot your continued support. The problem is that we need a very simple statement for the judge. With this man’s genetic code, he should not have been allowed to fly aircraft now that we know they are mobile gas chambers. The more complex we make it, the more we will get bogged down in clinical and scientific argument. I am talking to a top medico legal witness in the states who specialises in OP poisoning and toxic encelopathies. Now that champerty is no longer illegal in the UK and we have no win, no fee lawyers, would you like to re open your case? Would you like to set a Wikipedia entry all about it? It could be a very useful resource…. We have walked the same path. I am truly shocked by the way you have been treated. Many thanks for sharing this with me. I am a farmers son and spent many years working on the family farm so Farmers Weekly may be interested! I am sorry to keep on asking questions but I am continually formulating legal angles at the moment. Now I know that OP poisoning is a listed industrial disease (and I have periferal neuropathy), I would like to look into this further. Can you provide a link to all the legal definitions for industrial diseases as a google search has not provided the answers. 67643 The definition of PD C3(b) is peripheral polyneuropathy or peripheral polyneuropathy with pyramidal involvement of the central nervous system, caused by organic compounds of phosphorus which inhibit the enzyme neuropathy target esterase. The prescription is work involving the use or handling of, or exposure to, organic compounds of phosphorus. What would the most efficient way of doing this? BBC News UK. 7 April 2013 Majority of ‘deprivation of liberty’ cases unreported, says report. Figures suggest around 7,000 people were deprived of their liberty without procedures being followed. Limits placed on the freedom of people with dementia or brain injuries are not being properly recorded, according to a healthcare regulator. The Care Quality Commission (CQC) said almost two-thirds of applications to restrict a person’s liberty were not reported to it, as required by law. In some cases, patients had their freedom removed for months at a time. Almost 12,000 applications were made to restrict people’s liberty between April 2011 and March 2012, an increase of 57% in two years. But in England the CQC found only 37% of cases were properly recorded last year. As a result, around 7,000 people were deprived of their liberty in a way that did not follow procedure. The Goverment do not require serial numbers to be added to certificates of mental incapacity, how many of the above including those with brain injury have been subjected to financial abuse like Leonard Lawrence Pilot whilst under the jurisdiction of the Official Solicitor to the Senior Courts and who details are not included in the above figures? 1: Lord Chief Justice Sir John Thomas, Lord Chancellor Chris Grayling MP and Sir James Munby President of the Family Division and Court of Protection. 2. Peter Jackson Court of Protection judge [The law is] completely inaccessible to those for whose benefit the legislation has been devised”. End Quote Mr Justice Peter Jackson Court of Protection judge. 3. AS OF 4th APRIL 2014 THE QUEENS BENCH DIVISION, ROYAL COURTS OF JUSTICE, ARE HOLDING FIVE COURT OF PROTECTION MEDICAL CERTIFICATES AND OTHER DOCUMENTATION THAT HAD BEEN ISSUED TO PROTECT MYSELF LEONARD LAWRENCE. 4. MASTER BASIL YOXALL AND MR JUSTICE ADRIAN FULFORD, NOW LORD JUSTICE ADRIAN FULFORD, HAVE REFUSE MY REQUEST TO DISCLOSE THE FIVE COURT OF PROTECTION MEDICAL CERTIFICATES TO SIR JAMES MUNBY, PRESIDENT OF THE FAMILY DIVISION AND PRESIDENT OF THE COURT OF PROTECTION. 5. WHY NOT DISCLOSE THE COURT OF PROTECTION MEDICAL CERTIFICATES TO THE COURT OF PROTECTION WHEN HHJ SIMON OLIVER IN APRIL 2012 IDENTIFIES THAT THE CASE HAD TO HAVE GONE TO THE COURT OF PROTECTION? 6. POSSIBLY BECAUSE THE OFFICIAL SOLICITOR ALASTAIR PITBLADO AND DEPUTY OFFICAL SOLICITOR MAY MAUGHAN HAD PREVIOUSLY ADVISED THE BAR STANDARDS BOARD AND THE LAW SOCIETY THAT LEONARD LAWRENCE HAD NEVER BEEN A PATIENT SUBJECT TO THE COURT OF PROTECTION. 8.SENIOR MASTER STEPHEN WITTAKER ALSO HELD THREE COURT OF PROTECTIONS MEDICAL CERTIFICATES CP3’S. THE COURT OF PROTECTION HAVE NO RECORD OF RECIEVING THESE COURT OF PROTECTION CP3’S FROM SREPHEN WITTAKER, POSSIBLY BECAUSE MAY MAUGHAN DEPUTY OFFICIAL SOLICITOR IDENTIFIED TO MASTER BASIL YOXALL THAT SHE HAD GIVEN INSTRUCTIONS TO ADMINISTRATION STAFF AT THE COURT OF PROTECTION NOT TO ALLOW, I LEONARD LAWRENCE, ACCESS TO A COURT OF PROTECTION JUDGE. MENTAL CAPACITY Act under Scrutiny: open for Evidence from You! | Victims Unite!